Raynaud's disease affects the circulatory system and causes the skin to be deprived of the many benefits that normal blood flow usually supplies. This results in numbness in both the feet and hands. It is usually more noticeable when an individual is faced with cold temperatures or stress and the result is their toes or fingers feeling extremely cold or becoming numb. 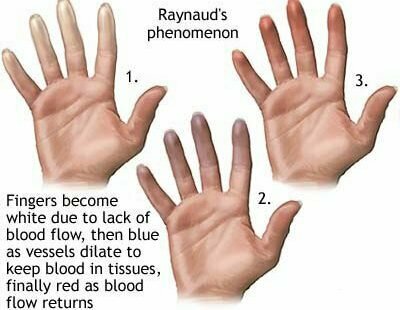 When Raynaud's attacks the body the arteries and capillaries become narrower and this is the primary cause in loss of blood flow. This tightening up of the capillaries and arteries is the body's normal response when it is trying to conserve heat. If stress is part of the cause, the body does the same thing, lessening the blood flow to the extremities and conserving it for use by the vital organs and muscles. A person who is suffering with Raynaud's deals with exaggerated symptoms which occur at inappropriate times. The lack of blood to the fingers and toes can cause them to take on a bluish tint or look pale. People with Raynaud's syndrome may notice their skin changing color, first it becomes pale and then it changes to blue, when they are cold or stressed – most noticeably in the fingers. They may feel a prickly numbness in toes and sometimes a stinging pain with throbbing and redness when they begin to relax or warm up as blood returns to the extremities. Symptoms of Raynaud’s occur in the extremities and may include the following in affected areas. It is really hard to diagnose this disease because it cannot be traced by a blood test. The only way to determine whether or not it is Raynaud's is by way of the symptoms. Your doctor will have to go by a description of the symptoms and rule out other medical conditions. A test that is often performed involves placing your hand into cold water in order to see it in action. Doctors are not sure about why this medical condition develops but it is understood that it is caused by the blood vessels overreacting to stress and cold. This is normal except that the response is more severe and untimely causing symptoms that can really trouble an individual. Raynaud's comes in two forms primary and secondary. The former develops without any other medical conditions involved and the latter happens alongside other medical conditions. Your treatment plan will be based on treating the underlying medical condition in secondary Raynaud's and it will also be important to keep the attacks from occurring as often. In extreme cases, the doctor will be focused on keeping the tissue from being damaged. There are many ways to go about treatment including natural remedies, conventional medicine and biofeedback. As Raynaud’s Disease is related to poor circulation, the most successful treatment methods are those that provide long-term assistance with circulation problems. Herbal and homeopathic remedies specific to the condition and containing ingredients such as Rosemary, Ginger, and Ginkgo biloba can do just this – in a natural manner! Used regularly, these work to effectively restore the function of the circulatory system; improving blood flow to the extremities while helping to prevent tissue damage. These herbal ingredients also address the underlying triggers of Raynaud’s by reducing inflammation and stress levels while working to guard against cold fingers and toes. Wow, great article, thank you so much for the natural tips. Hopefully ‘alternative’ healing methods will soon become the norm. Wouldn’t that be terrific? 🙂 Thank you so much for the comment! First of all, I had no idea that Raynaud’s Disease actually existed! This was a very interesting article, thank you for sharing it. Even though it isn’t life-threatening, it sounds like it causes quite a bit of discomfort for the affected person. Including the diagram was quite helpful in understanding what was being described. Thanks!